Pope Francis on June 28, 2018, appealed for the continued growth of communion between the Catholic Church and the Ecumenical Patriarchate. 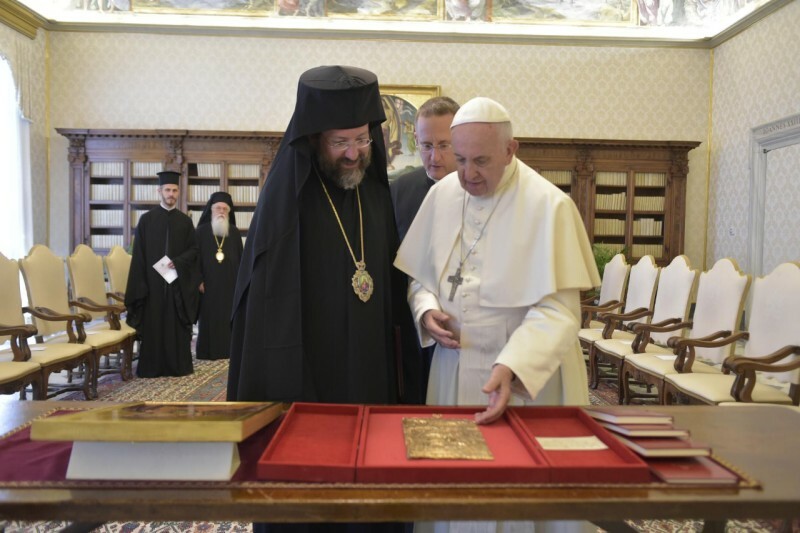 His comments came when receiving a delegation representing the Ecumenical Patriarch, Bartholomew I, the primus inter pare of the heads of the autocephalous churches the make up the Eastern Orthodox Church. Within the framework of the traditional exchange of delegations for the respective feasts of the patron saints –June 29 in Rome for the celebration of Saints Peter and Paul, and November 30 in Istanbul for the celebration of Saint Andrew –the delegation of the Ecumenical Patriarchate led by the Archbishop of Telmissos, Job, co-chair of the international mixed commission for theological dialogue between the Catholic Church and the Orthodox Church, accompanied by the bishop of Nazianzos, Theodoretos, and the deacon Alexander Koutsis, arrived in Rome yesterday. During the day yesterday, Wednesday, June 27, the delegation met at the Pontifical Council for Promoting Christian Unity for the usual conversations; this morning, Thursday, June 28, in addition to the audience with the Holy Father Francis, the group attended the Consistory for the Creation of new Cardinals; tomorrow, Friday 29 June, it will attend the solemn Eucharistic celebration presided over by the Holy Father.